Airscene News » Blog Archive » Iconic Jet to Perform Rare Air Tattoo Display! Iconic Jet to Perform Rare Air Tattoo Display! One of the world’s most iconic jets will make a welcome return to the Royal International Air Tattoo this summer – almost a decade since it last made an appearance in the flying display. 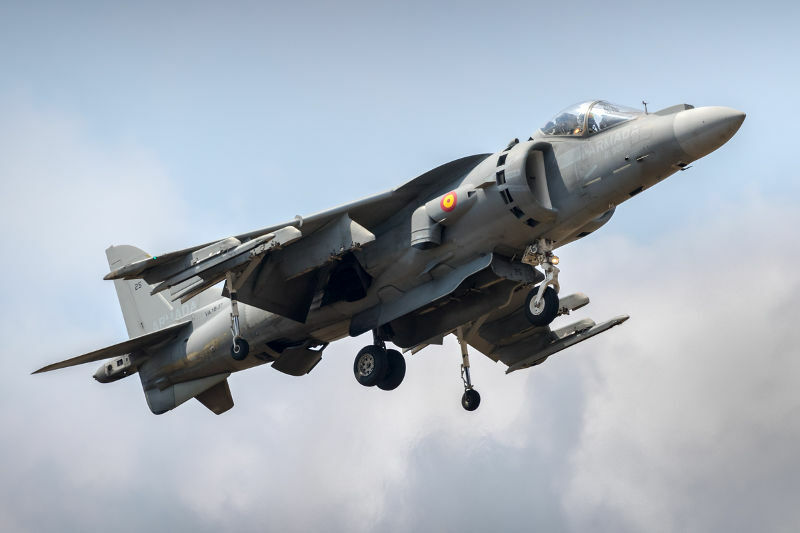 The Spanish Navy EAV-8B Harrier II Plus from 9 Squadron will display as part of the Air Tattoo, which takes place on 19-21 July at RAF Fairford in the Cotswolds. The aircraft is based at Rota Naval Base and operates from the Spanish Navy’s amphibious assault ship Juan Carlos I. Until the arrival of the Lockheed Martin F-35 Lightning II, the Harrier had been unique in being able to take off and land vertically, fly backwards, sideways and rotate on the spot. Its gravity-defying aerial displays were regularly among the highlights of the airshow’s flying programme. Spanish Navy Harriers, in the form of the earlier AV-8S and TAV-8S variants, were last seen at the Air Tattoo in 1994. In 2010, an RAF Harrier GR.9 performed its final Air Tattoo display prior to its retirement from service in March 2011. Spain remains one of only a handful of nations that continue to operate the Harrier, Italy and the US (US Marine Corps) being the others. Air Tattoo Chief Executive Andy Armstrong said: “The chance to see a flying Harrier is always a hugely welcome one, and we at the Air Tattoo are delighted that the Spanish Navy will be participating at RIAT 2019, especially in this NATO 70th anniversary year. Tickets for the airshow, which is staged annually in support of the RAF Charitable Trust, can be purchased online at www.airtattoo.com or by calling 01285 713456. (Tickets for Friday 19 July come with a £10 money off merchandise voucher if booked before 31 January). All accompanied under-18s go free.